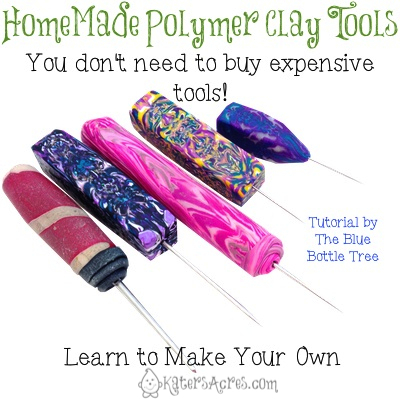 Yes, polymer clay can be an expensive hobby, but it can also be an inexpensive hobby. It depends on how much “creativity” you put into your studio. I have been claying since 2008 and since then I have made a variety of tools. Not because I had to, but because I wanted to! Part of the fun of making your own tools is that they are cheap, quick, & easy. Not to mention that when they break (or get left behind at guild, class, or retreats) you don’t feel near as bad! One of my favorite tools to make are needle tools. Why? Because needles come in different sizes & pointiness (notice my use of the technical term)… I use needle tools a LOT in sculpting. I use everything from straight pins to sewing needles, knitting needles, darning needles or tapestry needles (not shown), and heavy gauged quilting needles. But my favorite are blunt needles or tapestry needles because they indent the clay and smooth seams, and darning needles because they have bent tips for close-up detail work. The tools you see at the right are made from canes ends. I made these using the Natasha Bead technique. In fact, the three tools shown at the right I made the same day I did the tutorial for the Natasha Beaded Keychain. You can adapt the technique of the Natasha Bead to make your own too. But, since it’s Tutorial Tuesday … how about a little tutorial sharing? There are oodles of tutorials online on how to make your own needle tools … but this one from Ginger at Blue Bottle Tree is my favorite (and might I add the best written one I could find).